We provide a secure email service that protects your privacy. It's easy to use and only takes a few seconds to set up. You will never receive any ads, spam or viruses simply because no one will ever be able to access your data, including us. Reading, sending and organizing your emails has never been so easy. Topmail's interface is designed to be simple to use, to speed up your activities and increase your productivity. 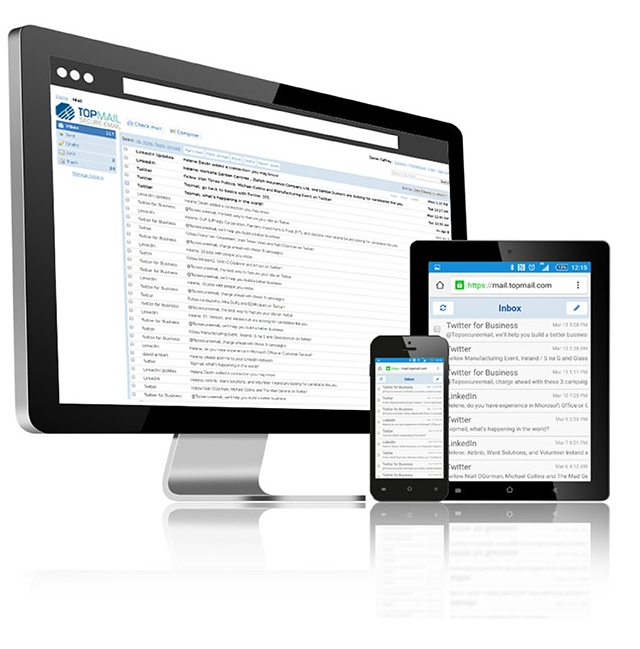 You can link your Topmail account with any Apple or Android email app, making it easily accessible from your mobile or tablet. Friendly members of our team will be happy to assist you anytime via Live Chat, Email or Twitter. Setting up your private email account takes just a few steps and less than 1 minute. We won't bill you for 14 days and we won't take your credit card details when you start your free trial. You can try out service completely anonymously, for free and cancel anytime. If you decide to stay with us, the cost is only $2.50 per month: less than the cost of one coffee per month. Valid email address can only contain numbers, letters and the characters '. ', '_', '-'. You must choose an email address There was an unexpected error trying to check if that email address is available. Please try again in a few seconds. This email address is not available. Please choose an alternative one! There was an unexpected error trying to reserve that email address. Please try again. Privacy is very important to me. I am totally against anyone using my personal data for marketing or for any reason whatsoever. That’s why I’m a Topmail Customer. Thank you for protecting my email communications since 2006. I was fed up with the problems with my Yahoo account and I wanted something reliable and safe. I've had a Topmail account for 9 years. I know I can trust my personal information with them. They always get back to me so quickly when I ask a question. I love that. Simple. Easy to use. No spam. It's exactly what I need. Provides a great email service. Emmet O'Rafferty has been providing protection against internet-based crimes such as hacking, viruses, phishing, fraud and scams since 2002 when he entered the digital assets security business. Since the beginning he found it remarkable that email users casually accepted the routine interception and reading of their personal email communications for marketing or 'security' reasons. Emmet launched Topmail in 2006 as a service designed to protect the privacy of ordinary email users. Now, then years after Topmail was established, in light of Snowden and the US elections in particular, the issue of email privacy has never been more important.